MOSUL, Iraq — "My dear family, please forgive me," reads the handwritten letter discarded in the dusty halls of an ISIS training compound in eastern Mosul. "Don't be sad and don't wear the black clothes (of mourning). I asked to get married and you did not marry me off. So, by God, I will marry the 72 virgins in paradise." They were schoolboy Alaa Abd al-Akeedi's parting words before he set off from the compound to end his life in a suicide bomb attack against Iraqi security forces last year. The letter was written on an ISIS form marked "Soldiers' Department, Martyrs' Brigade" and in an envelope addressed to his parents' home in western Mosul. Akeedi, aged 15 or 16 when he signed up, was one of dozens of young recruits who passed through the training facility in the past two-and-a-half years as they prepared to wage jihad. In several cases this involved carrying out suicide attacks — ISIS' most effective weapon against a U.S.-backed military campaign to retake the group's last major urban bastion in Iraq. His letter never reached his family. It was left behind with a handful of other bombers' notes to relatives when ISIS abandoned the facility in the face of an army offensive that has reclaimed more than half of the city since October. The militants also left a handwritten registry containing the personal details of about 50 recruits. Not all entries had years of birth, and only about a dozen had photographs attached, but many recruits were in their teens or early 20s. These documents, found by Reuters on a trip into eastern Mosul after the army recaptured that area, include some of the first first-hand accounts from ISIS' suicide bombers to be made public and offer an insight into the mindset of young recruits prepared to die for the group's ultra-hardline ideology. Reuters interviewed relatives of three of the fighters including Akeedi to help determine where they came from and why they chose jihad. In rare testimonies by families of ISIS suicide bombers, they told of teenagers who joined the jihadists to their dismay and bewilderment, and died within months. Reuters could not independently verify the information about other recruits in the registry. ISIS does not make itself available to independent media outlets so could not be contacted for comment on the letters, the registry or the phenomenon of teenage suicide bombers. ISIS has attracted thousands of young recruits in Mosul — by far the biggest city in the caliphate it declared in 2014 over territory it seized in Iraq and Syria. The group has carried out hundreds of suicide attacks in the Middle East and plotted or inspired dozens of attacks in the West. The training compound visited by Reuters consisted of three villas confiscated from Mosul residents. Man-sized holes knocked through exterior walls allowed easy access between the villas. Lower floors were littered with ISIS posters and pamphlets on topics ranging from religion to weaponry, as well as tests on warfare and the Koran. Green paint and bed sheets on the windows obscured the view from outside and gave the rooms an eerie glow. Flak jackets and body-shaped shooting targets filled one room, while medicines and syringes were scattered around another that appeared to have served as a clinic. The rooms upstairs were packed full of bunk beds with space for almost 100 people. Printed signs outlined strict house rules. One ordered: "Brother jihadi, respect quiet and cleanliness". Most of the recruits listed in the registry were Iraqi but there were a few from the United States, Iran, Morocco and India. Akeedi's entry says he pledged allegiance on Dec. 1, 2014, a few months after the jihadists seized Mosul. A relative told Reuters by phone that Akeedi's father was deeply distressed by his son's decision but feared punishment if he tried to remove him from ISIS's ranks. Reuters was unable to contact his father. "His mind was fragile and they took advantage of that, promising him virgins and lecturing him about being a good Muslim"
Akeedi rarely visited his family after joining the jihadists. On his last trip home he told his father he was going to carry out a suicide attack in Baiji, an oil refinery town south of Mosul where the militants had been fighting off repeated offensives by the Iraqi military. "He told his father, 'I am going to seek martyrdom,'" said the relative, who declined to be named because he feared reprisals from ISIS or from Iraqi forces preparing to storm the area. A few months later, Akeedi's family was told by the militants that he had succeeded. Another recruit of the same age, Atheer Ali, is listed in the registry beside a passport-sized photo showing a boy with bushy eyebrows and large brown eyes. He wears a dark collar-less tunic, a brown head covering and a cautious smile. His father, Abu Amir, told Reuters his son had been an outstanding student who excelled in science and was always watching the National Geographic TV channel. He loved to swim and fish in a nearby river and would help out on his uncle's vegetable farm after school. Ali was shy and slim, lacking a fighter's mentality or build, Abu Amir said in an interview at his eastern Mosul home, sifting through family photos. So the father was horrified when one day in early 2015 Ali didn't come home from school but ran off with seven classmates to join ISIS. When Abu Amir went to the militants' offices across the city to track down his son, they threatened to jail him. He never saw his son alive again. A few months later, three ISIS fighters pulled up at Abu Amir's house in a pickup truck and handed him a scrap of paper with his son's name on it. He was dead. Abu Amir retrieved Ali's body from the morgue. His hair had grown long but he was still too young for facial hair. Shrapnel was lodged in his arms and chest. He said the fighters told him he had been hit by an air strike on a mortar position in Bashiqa, northeast of Mosul. They described him as a "hero." Gathered in the family sitting room, Ali's relatives said he was brainwashed. Many of his school friends fled Mosul after the militants took control and Ali fell in with a new crowd, but his family never noticed a change in his behavior. "Even now I'm still astounded. I don't know how they convinced him to join," said Abu Amir. "I'm just glad we could bury him and put this whole thing to rest." 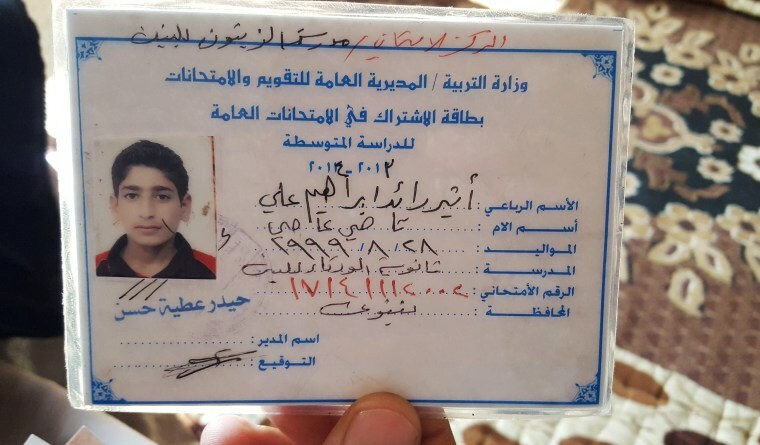 Sheet Omar was also 15 or 16 years old when he joined ISIS in August 2014, weeks after the group captured Mosul. Next to his registry entry is the fatal addendum: "Conducted martyrdom operation." Shalal Younis, Omar's sister's father-in-law, confirmed he had died carrying out a suicide attack, though he was uncertain about the details. He said the teenager, from the Intisar district of eastern Mosul, had been overweight and insecure and joined the jihadists after his father's death. "His mind was fragile and they took advantage of that, promising him virgins and lecturing him about being a good Muslim," said Younis. "If someone had tempted him with drugs and alcohol, he probably would have done that instead."